Bega Valley Shire Council is calling on all cyclists and drivers to get behind a new safety campaign aimed at curbing injuries and deaths on local roads. The ‘It’s a two-way Street’ campaign will educate people behind the wheel and handlebars to share the road safely through a series of 16 Drive and Ride Rules. Mayor, Michael Britten said that cycling crosses many barriers in respect to age, ability and distance, and as the number of bike users increases locally it is important to focus on safety for all road users. “Riding a bike has many benefits, and whether you are a regular cyclist or a driver who shares the road with cyclists, safety should be your number one priority. “We are fortunate to have some world class mountain bike trails in the Shire, and our growing network of bike paths in Bega, Bermagui, Merimbula and Pambula mean that an increasing number of people are coming to enjoy our local scenery from the comfort of a bike saddle. “With this in mind it is essential that we implement an educational campaign to make it safe for cyclists and motorists to share space on our roads. “Awareness and thinking about how we share the road with other users is an important focus, and this campaign is designed to get people thinking about road safety before they set off on their bike or in their car. “The overarching message of the campaign is to show mutual respect. With a strong educational component, including a series of eight drive and eight ride rules based on important road rules, behaviours and actions, this campaign has the real potential to save lives. “I urge all road users to take a minute or two absorbing the road rules on the campaign’s webpage. We want to reach every road user in the Shire, and with your help we can spread the word through posters, bumper stickers and social media. “We will be launching the campaign at the Bega River Day celebration this Sunday and at the Tathra Mountain Bike Enduro on June 6 and 7, so please come along and help us spread the message,” Cr Britten said. The ‘It’s a two-way Street’ campaign is being run in partnership with the Amy Gillett Foundation. For more information on the ‘It’s a two-way Street’ campaign, visit http://cyclesafe.gofundraise.com.au/cms/2waystreet?url=/itsatwowaystreet or call Council on 6499 2222. 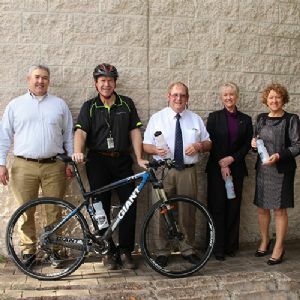 Photograph: Cyclist Tim Weber, with Cr Keith Hughes, Mayor Michael Britten, Crs Ann Mawhinney and Sharon Tapscott.